WHAT IS IT? A beautifully rustic natural material used to weave seats, backs, and stools. 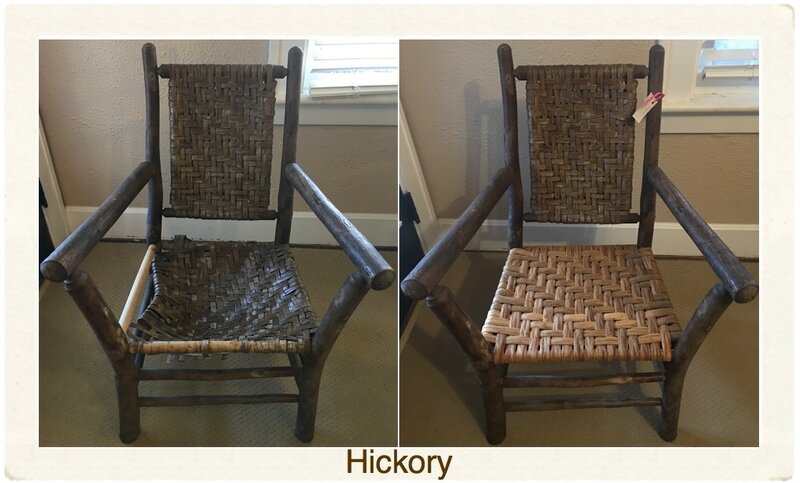 Most often seen on Appalachian and Adirondack furniture, but can be used on many other round runged chairs. MATERIAL: Hickory bark is hand harvested from by a family in Tennessee. A hickory tree must be felled and the strips are hand cut one by one. The width varies throughout. They cut to order and sell out very quickly. There are also periods during the year that it can not be harvested. Turn around time on this material can vary, but the material is so worth the wait! COLOR: There are natural variations in color and the wood grain shows throughout. Hickory can be left bare or areas that show can be easily sanded and tung oiled which help the material last longer. Sanding and tung oil application offered strictly between the months of May - September and depending on weather. Update: I am not offering this sand and tung oil service until summer of 2018 due to fume danger during pregnancy and maternity leave.